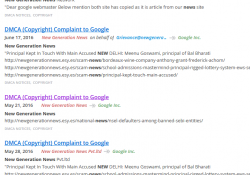 The fake DMCA claimed that an article published on 07 April 2015 by ‘Misha Bennedict‘ on athanews.com was copied on Ripoffreport in a complaint posted on 09 April 2015. The article was posted in March 2016, and not April 2015. 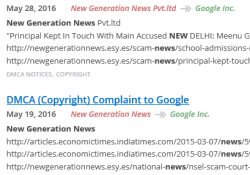 We can verify this by looking at the image URL structure in the article – http://athanews.com/wp-content/uploads/2016/03/1zd6sxx-150×150.png which has the yy/mm stamp in it. The author ‘Misha Bennedict‘ does not exist, but is a common name among other fake websites such as sydneylocalnews.com, fox18news.com and localnewsarizona.com. The website was simply a GoDaddy parking page from 2007-12-29 to 2016-03-04. The website was uploaded on 5th March 2016 and did not exist before that, as confirmed by hosting history and archive. The website is nothing but a free wordpress theme and a bunch of random old articles copied and posted on the website. Even the social media icons are not hyperlinked. Lala Ragimov and her husband have an unflattering article on Ripoff Report since a year. It is quite evident that this was hurting her business. Ripoff Report usually ranks high on Google and that must be making a dent in Ragimov’s reputation. 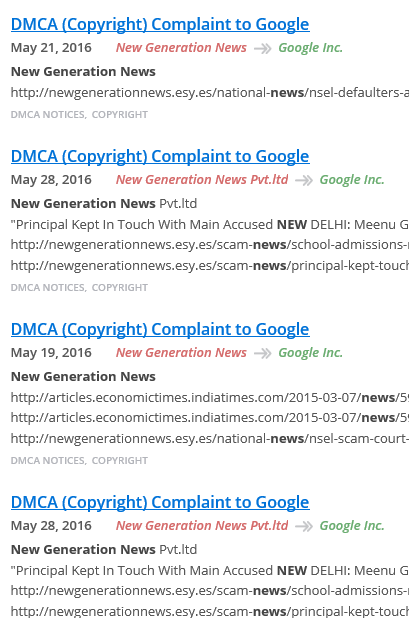 So they decided to redecorate the rules of engagement online, and turned to a bunch of scammers to fake a DMCA and try to get the Ripoff Report removed from Google. AND THEY SUCCEED. DAMN !! EDITOR’S COMMENT : For those who might ask – ‘why and how do we interject that ‘Lala Ragimov’ has something to do with this fake DMCA. 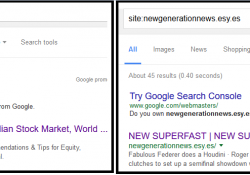 Couldn’t it be a coincidence ?’, we will say this – When someone goes and creates a whole new fake news site, falsifies his/her identity and submits fake DMCA to try and de-list some very targeted content on Google, it signals intent and a plan. It is obvious that ‘Lala Ragimov’ or someone he hired was directly involved in this crime. Lala Ragimov also cannot plead ignorance in this matter, since this notice on Google search is hard to miss, really.